The deadline for filing the annual returns (for the financial year 2017-2018) in Form GSTR-9, has been extended to the 30th of June 2019. Before filing GSTR-9, candidate must ensure that they have filed all annual returns in Forms GSTR-1 and GSTR-3B. Candidates are required to only declare the HSN codes for those purchased supplies that individually have a value of either 10% or more of the total value of purchased supplies. Candidates cannot avail ITC through Form GSTR-9. Every invoice relevant to the previous financial year, regardless of the month they were reported in Form GSTR-1, will be auto-populated in Form GSTR-9 (Section 8 Line A). In Form GSTR-9 Section 5 Line F, the value of "Non-GST Supply" must also include the value of "No Supply". This value may be entered in Section 5 Line D, Line E, and Line F.
The heading in FORM GSTR-9 "made during the year" with respect to supplies will be changed into "as declared in returns filed during the year". Dates associated with the GSTR-9. The Goods and Services Tax Return 9 is a document or statement that has to be filed once a year by a registered taxpayer. This document will contain the details of all supplies made and received under various tax heads (CGST, SGST and IGST) during the entire year along with turnover and audit details for the same. The government has introduced a GSTR-9C audit form, which is to be filed annually by taxpayers who have a turnover of more than Rs.2 crores. It is basically a reconciliation statement between the annual returns filed in GSTR-9, and the audited annual financial statements of the taxpayer. You must be a registered tax payer under the GST with a 15 digit PAN based GSTIN. The aggregate turnover of your business should be greater than 20 lakh rupees. This return applies to all registered tax payers under the GST excluding those who have a Unique Identification Number (UIN) and non-resident tax payers. You need to capture the details of all your transactions at the invoice level for the entire year. This includes intra-state and inter-state transactions, B2B and B2C transactions, transactions associated with exempted items, non-GST supplies and stock transfers between your business locations that are located across different states. The first part of the GSTR-9 form asks for your basic details: financial year, GSTIN, legal name, and trade name (if any). The second part of the GSTR-9 is split into two sections to collect information about different types of transactions. A. Supplies made to unregistered persons (B2C). B. Supplies made to registered persons (B2B). C. Exported zero-rated supplies for which tax has already been paid(except supplies made to SEZs). D. Supply to SEZs on payment of tax. 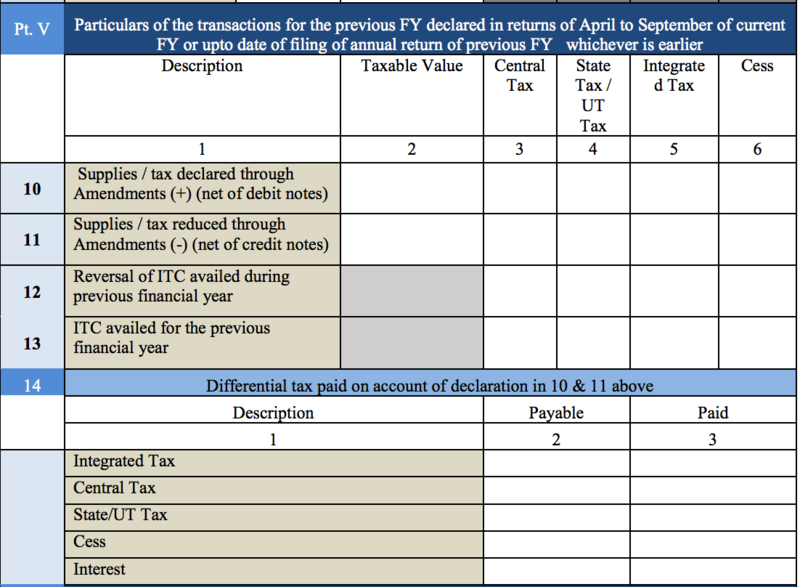 F. Advances on which tax has been paid but the invoice has not been issued (excluding those which have been mentioned in the above categories). G. Purchase supplies that are liable for reverse charge tax. H. The subtotal of the transactions mentioned in lines A to G above. I. Any credit notes that have been issued for the transactions mentioned above. J. Any debit notes that have been issued for the transactions mentioned above. K. Supplies or tax declared through any Amendments. L. Supplies or tax reduced through any Amendments. M. The subtotal of the transactions mentioned in linesI to L above. N. Supplies and advances which are liable for tax from lines H and M, above. A. Exported zero-rated supply without tax payment. B. Supplies made to SEZs without tax payment. 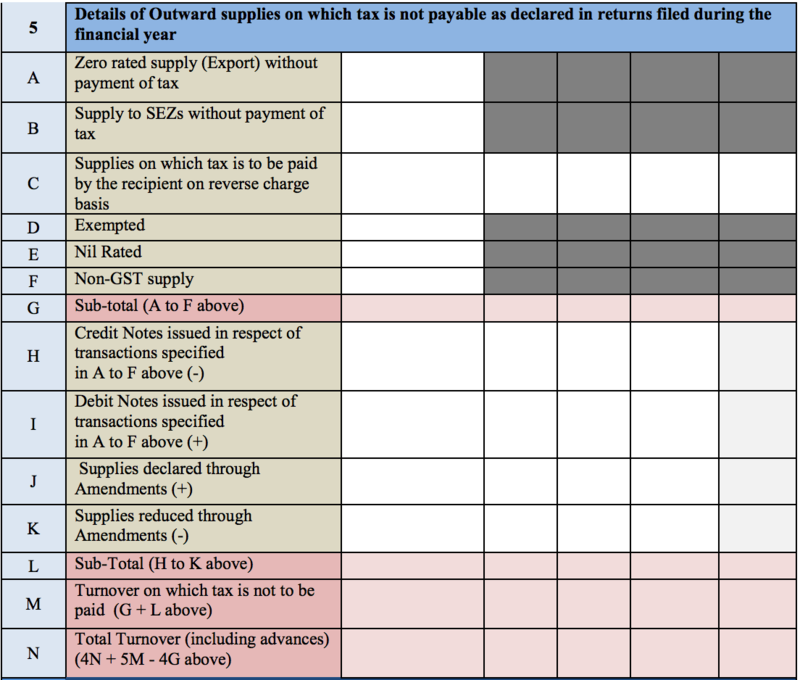 C. Supplies for which reverse charge tax is to be paid by the recipient. G. The subtotal of the transactions mentioned in lines A to F above. H. Any credit notes that have been issued for the transactions mentioned above. I. Any debit notes that have been issued for the transactions mentioned above. J. Supplies declared through any Amendments. K. Supplies reduced through any Amendments. L. The subtotal of the transactions mentioned in lines H to K above. M. The turnover amount which is exempt from tax from line G and L above. N. The total turnover amount, inclusive of all advances (4N + 5M - 4G above). 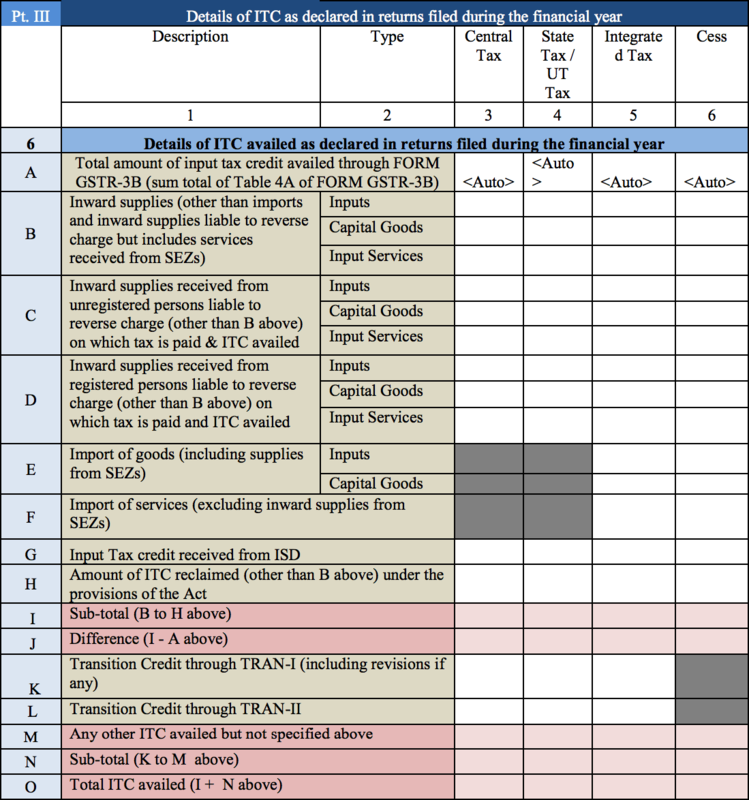 The third part of the GSTR-9 form is split into three questions that ask about your ITC balance. A. The total amount of ITC availed through GSTR-3B. B. The purchase supplies made for inputs, capital goods, and input services (excluding imports and those purchase supplies that are liable to reverse charge, but including services received from SEZs). C. The purchase supplies received from unregistered persons for inputs, capital goods, and input services which are liable to reverse charge, for which tax has been paid and ITC has been availed, except those mentioned in line B above. D. The purchase supplies received from registered persons for inputs, capital goods, and input services, which are liable to reverse charge, for which tax has been paid and ITC has been availed, except those mentioned in point B above. E. The imported goods, including supplies from SEZs, for inputs and capital goods. F. The imported services, excluding purchase supplies from SEZs. G. ITC that has been received from the ISD. H. The amount of ITC reclaimed (besides that mentioned in line B above), under the provisions of the CGST Act. I. The subtotal for lines B to H above. J. The difference between lines I and A (I - A). K. The transition credit mentioned in TRAN-I, along with any revisions. L. The transition credit mentioned in TRAN-II. M. Any other ITC that has been availed, but not mentioned in any of the lines above. N. The subtotal for lines K to M above. O. The total ITC availed for lines I and N.
A. As per the reversal of ITC in cases of non-payment of consideration (Rule 37). B. As per the procedure for distribution of ITC by the ISD (Rule 39). C. As per ITC with respect to inputs or input services and reversal (Rule 42). D. As per ITC with respect to capital goods and reversal (Rule 43). E. With respect to the blocked credits under GST (Section 17(5)). F. The reversal of credit mentioned in TRAN-I. G. The reversal of credit mentioned in TRAN-II. H. Specifications of any other reversals. I. The total reversed ITC mentioned in lines A to H above. A. The ITC as given in GSTR-2A. B. The total sum of ITC mentioned in line 6B and 6H. 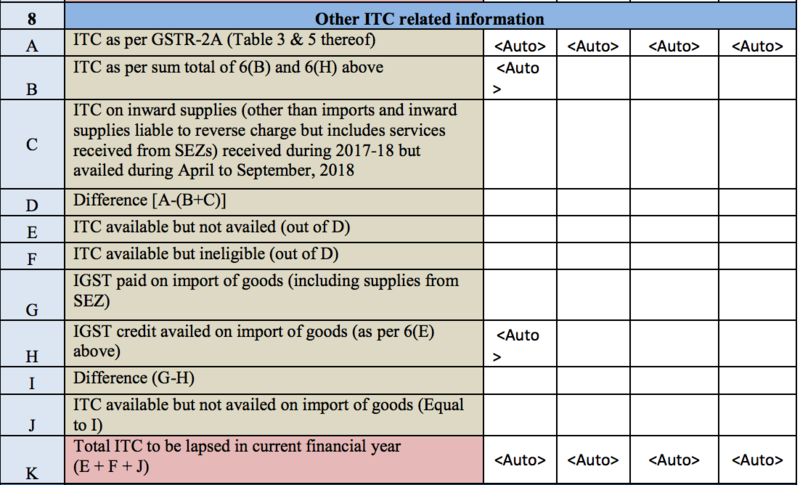 C. The ITC on sales supplies besides imports and inward supplies liable to reverse charge. Include services received from SEZs during the duration of 2017-2018 but availed between April and September, 2018. E. The ITC that is available, but has not been availed, from line D above. F. The ITC that is available, but is ineligible, from line D above. G. The IGST paid on import of goods, including supplies from SEZs. H. The IGST credit availed on import of goods, as mentioned earlier in line 6E. J. The ITC available but not availed on the import of goods (should be equal to line I). In this part of the form, you can specify all the details regarding the tax that you have paid and declared in returns filed during the financial year. A. The supplies or tax declared through amendments. B. The supplies or tax reduced through amendments. C. The reversal of ITC availed during the previous financial year. D. The ITC availed for the previous financial year. A. The integrated tax value (IGST). B. The central tax value (CGST). C. The state (SGST) or UT tax value. 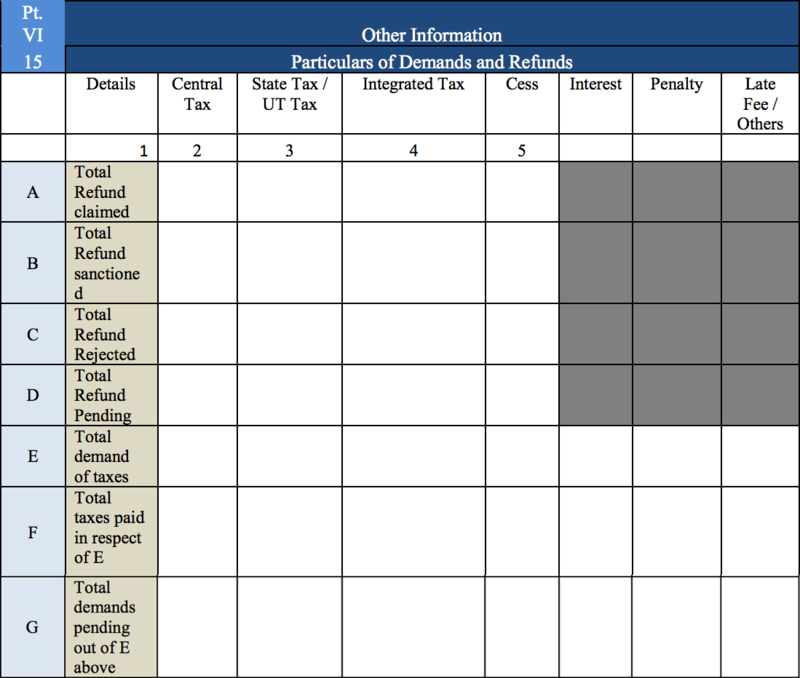 Part 6: Other Information The final part of the GSTR-9 form collects information that hasn’t been provided earlier, such as demands and refunds, certain special kinds of supplies, HSNs, and late fees. A. The total refund claimed. B. The total refund sanctioned. C. The total refund rejected. D. The total refund pending. E. The total demand of taxes. F. The total taxes paid for line E above. G. The total demands pending from line E above. Section 16 is for information on supplies received from composition taxpayers, deemed supplies, and goods sent on an approval basis. 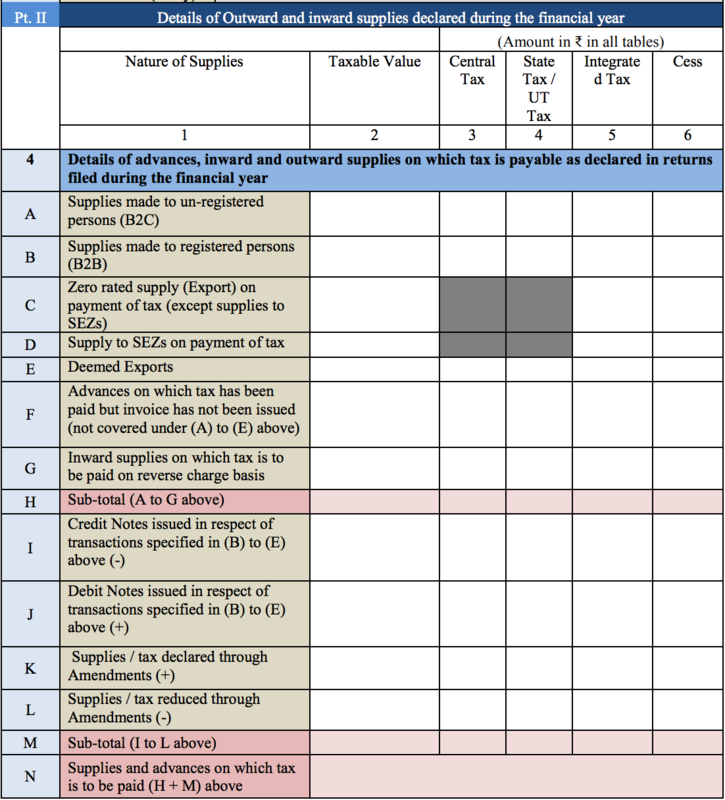 Here, fill in the taxable value, central and state tax, integrated tax, and cess value for the following: Supplies received from composition taxpayers. Deemed supplies listed under Section 143. Goods that have been sent on approval basis, but have not been returned. 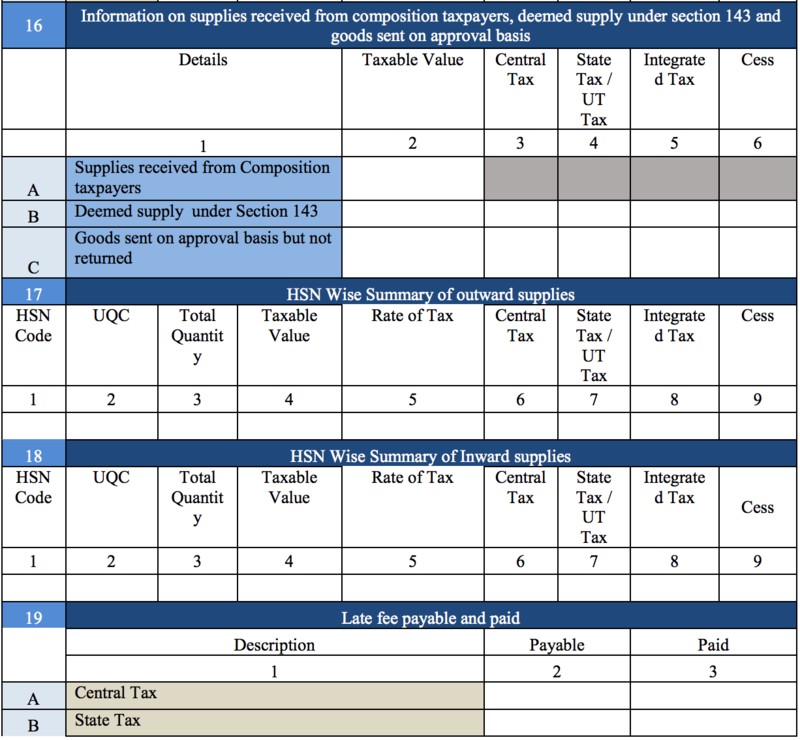 Sections 17 and 18 are for listing the HSN-wise details for both sales and purchase supplies, along with their corresponding tax details and HSN codes. Section 19 is for details of payable and paid late fees related to central and state taxes. Last but not least, before filing the GSTR-9 return, you have to sign and authenticate the return either through a digital signature certificate (DSC) or by using an Aadhar-based signature verification mechanism.